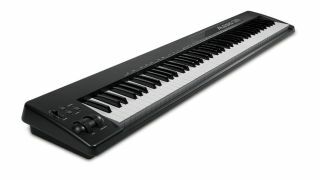 NAMM 2013 PRESS RELEASE: Enjoy the extended range of a full piano keyboard with the Alesis Q88. Equipped with 88 semi-weighted, velocity-sensitive keys, the Q88 provides an excellent feel that conveys all the nuances of your playing. Pitch bend and modulation wheels ensure an expressive performance, plus you can transpose to quickly play in any key. At just 22 pounds (10kg), the compact and portable Q88 is equally at home on stage and in the studio.